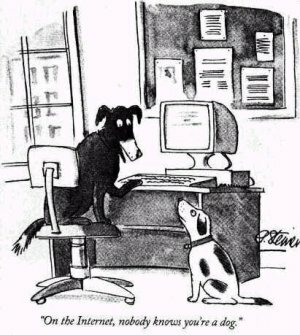 It might have been true once that on the internet no-one knows you’re a dog, but sometimes people make it their business to find out. Particularly if they don’t like what you’ve been barking. I’ve been following the controversy around supposed bullying on Goodreads on Twitter and various blogs in the past few days. Basically, a group of authors who didn’t like critical reviews of their work anonymously started a website, Stop the GR Bullies, which aggregated information about reviewers and warning readers that their reviews shouldn’t be trusted (a very sanitised description). I haven’t seen all the screen-shots, and it seems that quite a few posts have been taken down, so I don’t know the details of who said what and when. Foz Meadows has a good post about it here. The situation isn’t directly related to my research, but it reminded me a lot of RaceFail 09 with the ‘outing’ of anonymous users. It’s all about power: who is allowed to have a voice, and what they are allowed to say. And who decides. All those questions are connected to issues around race and gender and class. The social and cultural systems that privilege certain voices offline aren’t suddenly erased in the virtual world. Even on the internet, some dogs bark louder than others, and some get muzzled.